Modern, modular, flexible – that’s a simple, three word summary of the new generation courseware now available for the new QUBE-Servo rotary servo experiment. From this courseware, professors can take the teaching materials they need, then mix and match them to support the controls topics they’re addressing in their individual courses. The new QUBE-Servo Rotary Servo Experiment comes with a new generation of mix and match, rich media courseware for easy integration into professors' specific controls courses. Such flexibility means professors aren’t tied to any predetermined teaching sequence. They can teach their controls courses their way. All they have to do is select any of the provided QUBE-Servo experiments and insert it anywhere within their existing controls course. The courseware is ABET-aligned and come in rich, multiple formats so the relevant materials can be easily added to a professor’s course notes and lectures. Also included is a convenient textbook mapping guide that allows professors to match control topics to specific chapters from the most popular control engineering textbooks. All these features mean professors can bring richer teaching material to their controls courses, while also saving themselves valuable prep time. Win, win! 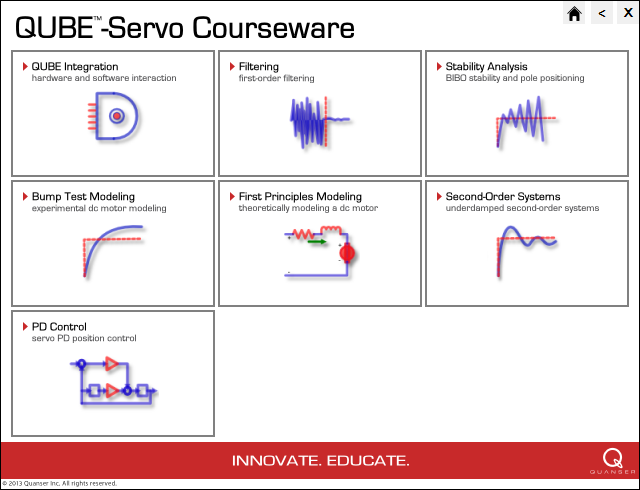 To learn more about the QUBE-Servo’s new courseware, watch the video.